This is a dense chocolate cake recipe for those who can’t tolerate wheat or gluten. 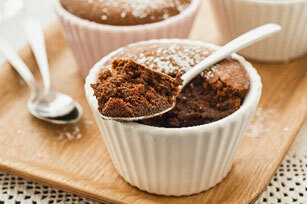 Try our easy Mini Flourless Chocolate Cakes recipe for dessert at your next gathering. Spray 6 (125-mL) ramekins with cooking spray. Place ramekins in 13x9-inch baking dish; set aside. Combine chocolate and butter in large microwaveable bowl; microwave on HIGH for 2 to 3 min. stirring after every min. or until completely melted. Meanwhile, combine eggs, granulated sugar, almond-flavoured liqueur and vanilla in large bowl and beat with mixer until mixture becomes frothy and almost doubles in volume, about 5 min. Fold 1/3 of the egg mixture into chocolate mixture with spatula. Repeat process 2 more times, until all of the egg mixture has been folded into the chocolate mixture. Divide the batter evenly between prepared ramekins. Add enough water to baking dish to come halfway up the sides of each ramekin. Bake 25 to 30 min. or until cakes have risen slightly, and edges are just beginning to set. Remove ramekins from baking dish and set aside to cool, about 10 min. Dust each ramekin with icing sugar. Serve warm or at room temperature. Top each mini flourless chocolate cake with fresh raspberries or sliced strawberries.